My answer has evolved over the years. I’ve managed to hone it down to this one sentence: The ability to consistently communicate a feeling and narrative through exceptional, personal image-making. If you ask the same question to multiple art directors, I suspect you’ll get a similar answer. Some art directors may throw in “problem-solver”, “dependable”, and “collaborator”. Those are good, too. But they don’t necessarily help illustrators who haven’t had a chance yet to show those qualities. I don’t really know how dependable you are until we’re working together, right? This post will cover typical ways in which I find and hire you. 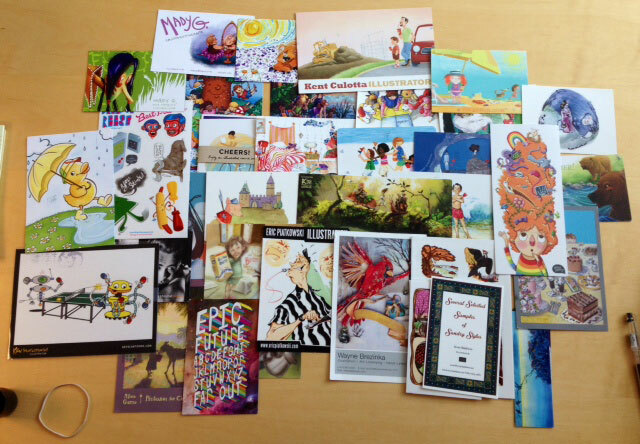 In my years in children’s book publishing, I’ve overseen the art and design of hundreds of children’s books. They differed in complexity, format, genre, and target audience. They were illustrated in every major medium (acrylic, oil, digital, mixed-media, watercolor, pencil, pen, ink, and on). Here’s how my designers and I would start them: we would ask “What feeling are we trying to convey?” The answer could be any combination of: gross, funny, sweet, epic, empathetic, inclusive, eerie, mysterious, light, dark, friendly, accessible, etc. Then, we’d identify the prefered visual approach (Not “style”. I hate that word. I explain how much I hate that word in this post.). Questions posed included: Who is the target audience? Are we looking for something soft and ethereal? Or direct and bold? Graphic? Representational? Will they also need to do black & white interiors? Once we gathered as much information as possible from our editorial team, we would begin to look for illustrators. My guess is that at this point in the process, most art directors are saying, “Yeah, I start that way, too.” It’s at this point of the search where I imagine we all separate in our approach. Notice I didn’t say “perfect”. That’s another word I hate. It’s the perpetually moving goal post. As an illustrator, striving for “perfect” will most likely result in anxiety and a deadening of the creative process. I prefer “good”, “smart”, “well-executed”, and “interesting”. I also place a high premium on “personal”. Is your voice coming through in your work? Or are you just copying someone else? Also notice that I haven’t said anything about how many awards you’ve won; what school you attended; or who your previous clients are. Most art directors will say that none of that matters. All that matters is the art. Of course awards and clients suggest affirmation and competency, and the school you attended will definitely inform your work. But it always goes back to the art. That is the only constant. Art directors look for artists in many different ways. They include: postcards, conferences, agents, art shows, online artist collectives, blogs, and social media. Postcards are an excellent, affordable way to get your art in front of art buyers. Read more about my love for postcards here. They need to be nicely printed (you can do that yourself); displaying your best work on one side, and your information on the other. They don’t have to be fancy. Don’t waste space with a lot of text. Let your image do the talking. The thumbnail image for this blog post is from my #mailersandcoffee meetings in which my design assistants and I reviewed YOUR postcards. You should check them out. I want to emphasize that in order to have a chance at a career as an illustrator, you must market yourself. There are countless ways to do this. It’s only through research and trial & error that you’ll figure out what works best for you. It’s better to do a few of these things really well; as opposed to doing way too much poorly. For example, I use Twitter and Facebook. That’s about all I can handle. But I try to utilize them in many different ways. At conferences, you don’t have to be the most gregarious person to network. Be yourself. Be courteous and respectful. Most of the people you approach are not “celebrities”. It’s ok to say a nice thing or two about them, but don’t gush. You are the talent. We should be gushing over what you do. Not the other way around. The Illustration community is a collaborative one. It’s important for illustrators to reach out to other illustrators. Team up to create mailing lists, critique groups, and online collectives. One of my favorite collectives to visit was a Legend of Zelda fan art site called fillupyourhearts. It’s no longer updated, but there are still plenty of good illustrators on display. Another collective was terribleyelloweyes. That site was an homage to Where the Wild Things Are. This is the contact sheet I created for Francesca Gambatesa. She would later become the illustrator for our Recipe for Adventure chapter book series. What tends to happen is that one person’s blog or site will link to another and another and another. I can’t tell you how many new artists I’ve found just from the “Friends” links on many of your blogs. During the search, I would create contact sheets by pulling images from websites. It’s important to keep your site updated. I’d rather see eight to ten very strong pieces, than twenty pieces of varying quality. If you don’t have a website, get on that right now. You don’t need a lot of money—or even that much art—to have a good one. I see building a website like gardening (this won’t be the last gardening metaphor you see on the #arttips blog, trust me). You clear out all the weeds; focusing on what is essential. You don’t need much for a great garden. Slowly, through care and time, you build the garden. You’ll prune. You’ll learn. Sometimes you’ll fail. But believe me, the rewards will far outweigh the effort.